If you’re one of my regular readers on this site (which I doubt since I’m not exactly a regular poster on this site, giving you nothing to read regularly) then chances are you probably haven’t heard of Rooster Teeth, although you may have heard of some of their more famous work such as RWBY, Red vs Blue, or possibly Lazer Team. If you’ve never heard of them then I’m sorry, because chances are you won’t recognise anyone in these images, although perhaps you can appreciate how it feels for me to have been able to take these images at all, and how surreal it feels to be bringing this post to you. Hopefully you can at least appreciate this post as a decent example of event photography containing a bunch of decent shots of people. 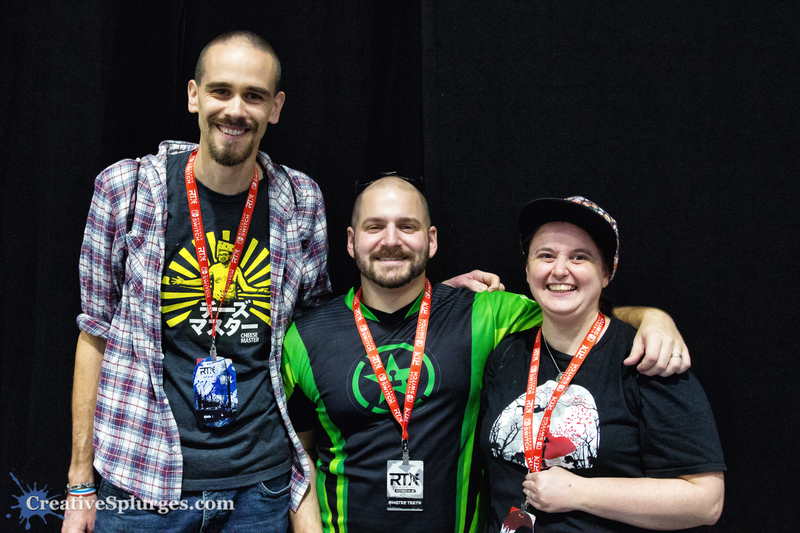 On the flip side, if you’re a member of the Rooster Teeth community who found this post looking for images from RTX of any of the Rooster Teeth talent (or because I shamelessly posted the link to this page all over the place), then you’ll have to bear with me as I fill in some of the gaps for anyone reading who has no idea who these guys are. So, what is RTX? It’s the annual (or now, thrice annual) convention for fans of Rooster Teeth, so perhaps I should back up a level and answer the question, what is Rooster Teeth? Rooster Teeth is an Austin, Texas-based production company, producing live action, animated and gameplay content delivered on their own site and via YouTube. They started out in 2003 with Red vs Blue, a show made within the game Halo, and have since expanded to be a company with several hundred employees, many of whom have serious jobs at the company in addition to being onscreen talent. Which brings us to RTX, which started out as an annual convention in their hometown of Austin. Last year this expanded to include an annual visit to Sydney, and this year London was added into the mix. As a big Rooster Teeth fan, there was no way I was going to miss this. RTX London was last weekend. As you’d expect, I took my camera. After we’d arrived and collected our passes, we headed onto the show floor, where Adam Kovic and Bruce Greene were playing Super Mario Odyssey. We should probably cover this from the start: the audience for the centre stage was packed. They had planned for several hundred people to sit in the audience and watch. They didn’t account for the fact that over a thousand more would stand surrounding the seats, keen to see some of the big ticket events such as Off Topic and the RT Podcast after years of being starved of seeing them in person. This twitter post shows just how busy it got. For the most part, I was standing to the right of the stage, which for capturing photos worked out pretty well. Standing meant I could get a slightly better view over the computer monitors (although not enough to see faces when people were sitting down) and I was able to stand closer to the stage than I’d have been able to get if I’d relied only on getting an empty seat. Combined with my 300mm telephoto, it meant I was able to get some pretty decent images of the stars on stage. We abandoned centre stage for a bit, got to meet Jeremy Dooley, and looked around some of the stands before returning to centre stage to watch Geoff and Gus play some 1-2-Switch. Watching these two was a joy. As two of the founding fathers of the company we don’t get to see them together very often but they are still clearly good friends. It was a highlight of the weekend watching them have fun together on stage. As you can see, much like the other stage-based photography I’ve done, I struggled with the lack of light. I was shooting at ISO as high as 4,000, although fortunately for the most part I was able to go lower. Even so, the images suffer from the usual noise and slight softness that often result from shooting at higher sensitivities. The highlight of the Geoff and Gus segment – and one of the highlights of the whole weekend – was the fashion show mini game, which saw the two strutting their stuff across the stage. In post-processing these images, I tended to change the photos that contained emotion into monochrome. It just seems to work better. After Geoff and Gus’s bit ended, we continued to camp out the spot we had, considering Off Topic (the podcast of Achievement Hunter, Rooster Teeth’s gameplay branch) would be up later, and very popular. As well as, hidden behind one of the cubic computers so not appearing in many photographs, Goeff and Jeremy. And, of course, being Off Topic, there were bevs. We were also treated to a surprise guest: Inbetweener and Achievement Hunter fan James Buckley. The next shot is one of my favourite of the whole weekend, and has gone down well over on social media. From this point, photographically it was much the same as the rest of the day: trying to grab those little moments on camera. I had been struggling to get my camera, in aperture priority mode, to expose the shots correctly. It would sometimes find a bit of shadow and overexpose to compensate, lengthening the shutter and turning shots into a blurry mess. I soon remembered something I’d figured out shooting theatre shows – find some settings that work well, and set the camera to manual, in order to not push the ISO too far and not have it confused by stage lighting. This is how I shot from here on out. This shot also resonated well with the community, mainly because it captures a typical interaction between Michael and Gavin so well. Gavin is known for having a bit of an overactive gag reflex, especially when confronted with anything a bit gross. Which means that his reaction to seeing James Buckley’s earwax-laden headphones was largely predictable. Geoff, meanwhile, decided to try to impress his teenage daughter back home in Texas by getting the whole audience to say hello to her in a video. I grabbed this shot of him right at the end of his recording. As I said, for the most part I didn’t get shots of Geoff or Jeremy because they were sitting behind a computer, but on this occasion they all stood up in order for a scotsman to try a tongue twister and I got my only group shot of the podcast. Most of my remaining images from Off Topic are slightly wider group shots. The next day we briefly caught a little bit of a Funhaus vs Achievement Hunter match whilst queueing for the merchandise store. The only shot I got was this one of Bruce Greene. After stocking up on merch, we returned to the centre stage to see Rooster Teeth founder Burnie Burns interview a couple of the team working on Sea of Thieves. My plan for day two was to try to get photos of some of the Rooster Teeth staff I hadn’t photographed on day one, and Burnie was one of the main scalps I was after. We correctly surmised that the crowd for the RT Podcast would be rammed, and that we’d have to spend most of our day standing around waiting for it if we were to get any sort of decent view. Instead we spun off and watched a great panel where Bruce and Adam played Wolfenstein II, and returned for the last half hour or so of the podcast. Even at 300mm my view from the back wasn’t great. After the podcast the crowd dispersed, and we were able to get seats to see Michael and Gus play some more Super Mario Odyssey and Splatoon. Fortunately someone standing near me called out some advice when Michael was stuck on Odyssey, leading to him pointing roughly in my direction. Soon Gus did something similar. By this point it was late in the day and the events and panels were over, so we took another wander around the con floor (where Jeremy was still meeting people, something he did for a massive portion of the weekend, which was absolutely amazing), spent some of our leftover cash on the merchandise store and at the American food stall, and then made our way home. A week later and I still can’t quite believe RTX finally happened in London. I’ve been following Rooster Teeth in one way or another for over a decade (in fact, this month marked the tenth anniversary of me creating an account on their website), and a more serious fan for the last four, but have been stuck watching RTXes across the pond on Twitch with jealousy. It was great to finally get to see some of my heroes in person, actually meet one of them, and get to hang out with a building full of like-minded people. My main regret is not getting any photographs of some of the great cosplayers that were there at the event, something which I’d like to improve on next time. That said, I’ll definitely be going next year, assuming there is an RTX London 2018 – but I am very tempted to do so as a Guardian, the volunteers that help look after the whole event, managing queues and helping out. The only reason I didn’t sign up this year is that this was my first con, and I wanted to experience it properly as a normal attendee. In order to get these images out for the community to use I’ve already published these images to Flickr. As ever there’s a lot more there than I’ve included on this page, so go check them out. I know things have been a bit quiet on this site lately. Life continues to be busy, I have a new job, and although I’ve taken a healthy (but not particularly excessive) amount of photographs, finding the energy and drive to edit them in the first instance and then get them written up and posted is proving difficult. RTX has proven to be a bit of an inspiration. I’m just not holding my breath that I’ll be able to keep the momentum going.